KomenWatch | Keeping our eyes and ears open…..
Keeping our eyes and ears open…..
What Could the Future of Breast Cancer Advocacy Look Like? Organizations focusing on breast cancer, other cancers, and public health work together to form reasonable partnerships, leverage available resources, and reduce duplication of services. Organizations use evidence-based information along with the highest professional and ethical standards to develop programs and increase their sustainability and capacity. Organizations systematically and continuously evaluate their programs for efficacy, efficiency, and relevance. Organizations are clear and transparent about whose interests they represent. Any organization working toward the eradication of cancer does not (directly or indirectly) endorse, partner with, or accept donations from any entity that contributes to the production or distribution of known or suspected carcinogens. Any organization working toward the eradication of cancer does not (directly or indirectly) accept donations (monetary or in-kind) from any entity that profits from the diagnosis or treatment of cancer. Research into cancer causation, prevention, detection, treatment, and aftercare is coordinated and, at times, collaborative to foster the greatest impact. Organizations that fund research work within this structure, with clear, evidence-based criteria for funding decisions. What is Komen’s Role in this Future? Remember that Susan G. Komen for the Cure is a nonprofit organization, not a nonprofit corporation as Nancy Brinker refers to it. Act according to sound ethical principles befitting of a nonprofit. Stop strong-arming other organizations over the phrase “for the cure.” Trademark or not, Komen does not own this common language. Support your sister organizations. Act in accordance with the mission of being “for the cure” and make research the top funding priority. Stop producing messaging and education programs that promote simplistic early detection and lifestyle prevention measures. Early detection is a misnomer for many cancers, and it is no guarantee of a cure. Partner with other breast cancer organizations to produce and disseminate evidence-based breast cancer awareness and education resources. Doing so will result in costs savings and economic synergies. Too many precious resources are being wasted on holding grandscale fundraising events. Consider the power of social media and other original ideas in your fundraising efforts. Prioritize funding and advocate for real prevention by commissioning studies on environmental factors, and by lobbying congress for legislation to stop corporate polluting and the manufacturing and marketing of known carcinogens. Fund research studies that encompass 10-year, 20-year, 30-year periods to gain a better understanding of survival and mortality statistics for ALL stages of disease. Scientists know that five-year survival statistics are inaccurate representations of breast cancer survivorship. Recognize the needs of women living with metastatic breast cancer; prioritize research funding in this area. Expand your vision to include other women’s cancers, particularly those that are known or suspected to be associated with the breast cancer genes (e.g. ovarian and colon cancers), those that can result from breast cancer treatments (e.g., uterine cancer, leukemia, and lymphomas), and those with similar causation. …KFC had a larger public relations problem on its hands in 2010, when it teamed up with Susan G. Komen for the Cure, the organization behind the pink ribbon campaign for breast cancer awareness. During the campaign, KFC changed the colour of its iconic bucket from red to pink, temporarily lit its headquarters pink, and repainted a Louisville restaurant. The Colonel Sanders look-alike who represents the company traded in his white suit for a pink version to complete the brand’s temporary transformation. The result was the single largest donation in the history of Susan G. Komen for the Cure – $4.2-million raised by 5,000 restaurants in the United States. The funds were used for local breast cancer education, screening and treatment, but the campaign provoked ridicule and lingering criticism. “Raising money in the name of breast cancer research, while engaged in a partnership with a corporation that may very well be contributing to this disease, is pink-washing in its most egregious form,” according to Think Before You Pink, an organization launched in 2002 due to concerns about the growing number of pink ribbon products on the market. It accused KFC of targeting low-income communities with a product containing carcinogens and fats linked to heart disease and breast cancer. In the same week, Nancy Brinker, Komen’s self-styled global leader of the breast cancer movement appeared on the CBS Early Show in a segment hosted by Rebecca Jarvis, and CBS’ own in-house medical attaché’, Dr. Jennifer Ashton, to discuss this latest development in mammography screening guidelines. Ms. Brinker’s public comments and appearances are to be expected in relation to the ongoing debate about the benefits, limitations, and risks of one-size-fits-all screening guidelines. The debate has a long history, and the Komen organization has been deeply committed to mammograms for thirty years without, unfortunately, much regard for the concerns raised in the medical and scientific community that call for improved accuracy, quality, and the development of specific risk profiles to determine which groups of people have the greatest chance of benefitting from screening. However, Brinkers’ appearances at this point in contemporary history involve more than the simple offering of an “advocate perspective” on screening. Brinker consistently uses her message to sell her brand. Although a departure from her usual pink ensemble, Ms. Brinker appeared resplendent on the CBS Early Show wearing a tailored orange jacket embroidered with Komen’s trademarked running ribbon logo. As the key figure head for Komen’s pink-ribbon brand, most of Ms. Brinker’s outfits feature the trademarked running ribbon. The Komen organization imprints the logo on a multitude of products from t-shirts to eggs to perfume to their founder. To our knowledge Brinker has yet to have the running ribbon tattooed on her body. As reporters, pundits, individuals, and MDs set up camp on one side or the other of the mammogram screening war zone they too get caught up in the branding. CBS’s own medical reporter, Dr. Jennifer Ashton, had Komen’s embroidered logo on her blouse. Is Dr. Ashton an employee of the Komen organization? Is CBS running an advertorial for Komen? Is the television spot another marketing strategy involving Komen product placement? Thankfully the host, Rebecca Jarvis, appeared to be trademark-free perhaps to indicate that CBS was committed in some regard to a more objective discussion of the issue. In the CBS video, Dr. Ashton outlined three of the more recent mammogram screening recommendations about when an average risk woman should begin screening and with what frequency. This is not an exhaustive list of organizations offering recommendations on screening, but it includes the American College of Obstetricians and Gynecologists (ACOG), the American Cancer Society (ACS), the National Cancer Institute (NCI) and the U.S. Preventive Services Task Force (USPSTF). The USPSTF did not “take this on.” They were mandated to systematically and comprehensively investigate and analyze the existing data on screening. Of all of the groups who have made recommendations on the subject it is, in reality, the only body that does not have a clearly vested stake in the findings. This is not to say that the merit of the findings, the procedures used, and the translational capacity of the conclusions should not be evaluated in their own right. They should. But there is no conflict of interest concerning this group of investigators and the issue at hand. And, if “most of us” already “knew” about that data, then why didn’t this information come out ten years earlier? Wait, it did. In 2001 a critical review of the clinical trials on screening was published in the medical journal The Lancet. It pooled the results and found only a 16% reduction in the risk of dying of breast cancer for women who were screened. It would be nice if mammograms were 100% perfect. Agreed. If they didn’t have a rate of false positives that approached 80%. If they didn’t miss 25-40% of tumors that were cancerous. If they could indicate whether a pre-cancer would progress or not into something dangerous. If “perfection” were achieved, however, the result would be a reduction in overtreatment and overdiagnosis (a good thing), but based on current knowledge about breast cancer and treatment it is not likely to reduce the number of deaths from the disease, and it would do nothing in terms of prevention. It would do a better job of diagnosing cancers, perhaps, but it would not stop people from dying of breast cancer. Ms. Jarvis then asks Ms. Brinker to clarify what she means by “political will.” Given that the federal government enacted the Breast and Cervical Cancer Mortality Prevention Act (1990) to insure access to screening for low-income, uninsured, and underinsured women and the Breast and Cervical Cancer Treatment Act (2000), which gives States the option of providing Medicaid coverage to low-income, uninsured and underinsured women, under 65 years of age, who have been screened and diagnosed through the National Breast and Cervical Cancer Early Detection Program and need treatment, political will does not seem to be at issue with regard to a commitment to screening. Acknowledging the limitations of screening, the lobbying of technology manufacturers, and the development of new diagnostic tools is another story. What about the studies that show 70 to 90% of people do not have their lives lengthened as a result of routine screening. What about the 5 to 50% of people who are overdiagnosed? What about the 20 to 30% of people who are over-treated, sometimes for conditions that are not life-threatening? What about the estimated one-third of the people considered to be “cured” of breast cancer who will then have a recurrence or develop metastatic disease, even those who were diagnosed at an early stage? What about the fact that the actual number of women and men dying from metastatic breast cancer has hovered around 40,000 per year, with no significant decrease since 1990? As the largest breast cancer fundraising and advocacy organization in the world, we expect more from Komen. Why is the Komen organization not asking these questions? Why are they aggressively promoting a stance on screening that is clearly questionable given existing evidence? Why is Komen avoiding the complicated questions and concerns that others have about screening? Isn’t it Komen’s job to advocate for the best interests of the entire breast cancer community? Doesn’t that include pragmatic criticism and scientific analysis of existing research as well funding new research to answer lingering questions? A victory for women’s health would be eradication of breast cancer. Not a screening technology, which is diagnostic at best, and doesn’t reduce the chances of dying from breast cancer for 70 to 90 percent of the population. Where’s the advocacy, Komen? Who do you work for? KomenWatch grants full permission to republish our editorials in their entirety, with proper citation and link. Citation for this editorial: KomenWatch. (2011, July 26). Where’s The Advocacy Komen? Retrieved from http://www.komenwatch.org/. We learned recently of yet another corporate partnership at the nonprofit corporation, Susan G. Komen for the Cure ®. This one is with a consumer products and distribution company named TPR Holdings LLC. 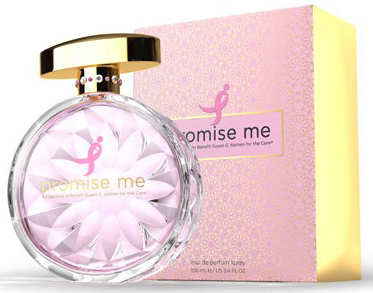 Together, SGK and TPR will not find a cure for breast cancer, but they’ll do the next best thing; develop and launch a new product line called Promise Me, the first and only proprietary fragrance developed with Susan G. Komen for the Cure®. New word alert: floriental. Perhaps a combination of floral and oriental? Not that it matters. The important thing is to tantalize women consumers with sophisticated femininity and a just a hint of sensuality and social conscience. 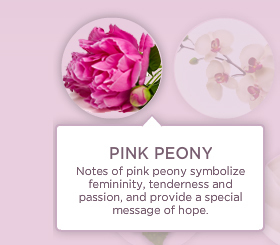 Readers can take a leisurely scroll over interactive images of orchids and pink peonies to learn what the special perfume ingredients are meant to signify. Providing a sense of intimacy, we even hear a voice (perhaps that of perfumer Jean Claude Delville…) who reads the pop-up text for us. The advertisement oozes inspiration and exquisite attention to detail all the way to the perfume bottle marked with SGK’s signature (and trademarked) running ribbon. Well-known French perfumer Jean Claude Delville speaks directly to the reader about the significance of the Promise Me fragrance. Color us inspired! A fragrance designed to evoke the emotions of positive energy, hope and love! 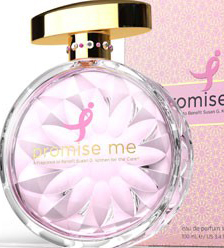 And a fragrance designed to generate sales for TPR Holdings and boost Komen’s public image and revenue stream. We learn on the “Susan G. Komen for the Cure ®” page that, “TPR Holdings will guarantee a minimum donation of $1,000,000 to Komen for breast cancer research, education, screening and treatment.” But it doesn’t stop there. Consumers who purchase the Promise Me fragrance will also get a free gift of Nancy Brinker’s new book, conveniently with the same name. 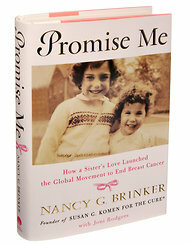 Promise Me tells the story of two sisters, Nancy G. Brinker and Susan G. Komen, their loving bond from childhood through adulthood, the cancer that took one sister’s life and threatened the other’s, and the promise between them that launched the global breast cancer movement, transforming and saving the lives of millions of women. Komen’s continued forays into the world of corporate partnerships are looking more and more like the activities of a for-profit corporation interested in staying in business for the long haul. The attention paid to branding; the continued promotion of Komen and it’s founder, Nancy Brinker as the self-styled leader of the global breast cancer movement; the plethora of pink products ranging from dish towels to sporting goods to housecleaning items to food and beverage products to hardware and now, to perfume and cosmetics suggests that the SGK brand – the mother of all cause-related marketing brands – is now being sold as a pink ribbon lifestyle. The breast cancer cause has moved beyond the oncology clinics, beyond the chemotherapy infusion rooms, beyond the radiation suites, beyond the surgical wards, beyond the shattered lives and grave markers of the fallen to be atomized into a fragrance, encapsulated in a pretty pink ribbon bottle — and all for the bargain price of $59.00 including the “free” copy of Nancy G. Brinker’s homage to her dead sister, Promise Me, the book. The message is clear. Piggybacking off of Komen’s branded pink ribbon cause is an effective form of advertising for any company that is willing to pay the price of admission: a large donation to Komen and the mandatory perpetuation of the SGK story-line. Non-profits are not in business to make money. They are a business to be sure, but unlike a for-profit, which seeks to dominate markets and yield profits, a cause or social enterprise seeks to provide a solution. When a for-profit business is successful, it keeps its doors open for years and expands and keeps looking for more market share. When a non-profit is successful it should close its doors because its business – or mission – has been completed. Are you competing just to raise the most money? Competing in the sense that a cause seeks to beat out its competition helps no one. It actually hurts the cause space by creating distractions and wasted resources. Komen’s words and actions speak loudly: A pseudo-corporation intent on keeping itself in business by marketing pink lifestyle products under the global brand of breast cancer. Don’t miss the next SGK commercial on the Home Shopping Network; Ambassador Nancy G. Brinker To Appear Live on HSN To Debut Exclusive New Promise Me Gift Set Benefiting Susan G. Komen for the Cure®. The scent of inspiration? More like the stench of breast cancer marketing. Citation for this editorial: KomenWatch. (2011, May 18). The Scent of Exploitation. Retrieved from http://www.komenwatch.org/. Leaders magazine, a “worldwide magazine that deals with the broad range of leadership thoughts and visions of the world’s most influential people,” recently interviewed Nancy Brinker, Founder and Chief Executive Officer of Susan G. Komen for the Cure. In the article titled “A Large Mission” Brinker discussed Komen’s work, progress, and intentions for the future. We saw the weaknesses in the system. People didn’t know how little money was going to research at the time – only $20 to $30 million of support for breast cancer research was coming to the National Cancer Institute, which was fairly new at the time. With this statement readers learn (or remember) that prior to the rapid expansion of breast cancer advocacy in the late 1980s and early 1990s there had been a dearth of breast cancer research. Nixon’s war on cancer had only been declared in 1971 and the National Cancer Institute was still an immature entity at the time of Komen’s founding in 1982. Brinker’s statement about research might even lead readers to assume that research was a major impetus behind its stated mission, to “cure” breast cancer. After all, how might a disease be cured? Treatment, and the research used to find, evaluate, and improve treatment. Accurate diagnostics, and the research used to develop, test, and refine diagnostics. Prevention, and the research used to locate the causes of a disease, learn its pathways, and prevent it from occurring in the first place. Education, based on the evidence amassed from bodies of systematic research. Cure relies on research. There’s no reasonable way around it. It’s always helpful to support research, but it’s not enough to do that; if you want to eradicate death by disease, you have to involve every sector of society…To that end, we have more than 120 affiliates throughout America, all of whom are grassroots based organizations who leave 75 percent of what they raise in their communities, focused on low resource people. So they provide education, screening, and some treatment, while 25 percent of what they raise goes back into our national grant pool. Education. Screening. Some treatment. And a national grant pool. We’re baffled. In 1982 research seemed to be a key mechanism to finding a cure. The National Breast Cancer Coalition continues to prioritize research funding through the Department of Defense and has set a new deadline to reorient research efforts in a coordinated way. Community-based organizations around the nation have formed their own partnerships with researchers and clinics because there isn’t enough research being done on a federal level. Yet 25 percent of monies raised by affiliates are sent back to Komen central allegedly for research. Okay, how does it add up? As one of our archived articles reports succinctly from Komen’s own audited financial statements, Komen’s research program in 2010 comprised only 19% of the organization’s total resources. The remainder went to education (37%), screening (12%), some treatment (5%), fundraising and other general overhead (27%). Research clearly is not the priority for the organization, and Brinker brings this point home in the Leaders interview stating, “it isn’t useful to just fund research.” The pie chart below is a visual representation of where Komen’s commitments lie. Today, knowing what we know, it isn’t useful to just fund research; to say you’re helping one woman at a time is not enough. You need to fund the research, but also to make sure that as you’re doing that, the clinical changes are occurring. Is ensuring clinical change part of Komen’s program allocations? Where is that? How is it accomplished? At the same time that Nancy Brinker and Komen clearly perceive research to be a minor part of curing breast cancer, the leadership fights over ownership of the trademarked phrase “for the cure” [i.e., see the articles under the category lawsuits] and consistently talks about its strong commitment to research over the years despite the fact that they believe it to be a minor part of eradicating the disease. Just this week Komen issued another effusive press release in which Komen announced that it will fund $55M toward research grants at 56 institutions across the United States and internationally, with $3M granted to support various patient support conferences and programs in 2011. That’s interesting. It sounds like a lot of money too. Note that $58M is a decrease of about $17M from last year’s research allocation. Why the decline in research funding? Komen had record revenues in 2010 of $389M. Maybe research is getting less and less important to finding a cure for breast cancer. At a whopping $58M, only 15 percent of Komen’s resources for 2010 were allocated to research the following year. FIFTEEN PERCENT. FIFTEEN PERCENT. FIFTEEN PERCENT. FIFTEEN PERCENT. Our goal at Komen is to fund research with the greatest potential to make a difference and save lives in the shortest period of time. That means putting our dollars toward cutting-edge research that is high-risk, with potentially huge rewards. Okay, we’re baffled again. If research is not Komen’s priority when it comes to funding, how can the organization expect to “make a difference and save lives in the shortest period of time.” High risk research could potentially result in some great finding that moves the state of science forward in such a profound way that cure is just around the corner. Maybe. But that’s not how medical research has worked in the past. Science moves in fits and starts. Incremental at best. Breakthroughs happen, sure. Wouldn’t Komen increase the odds of breakthroughs in science if it funded more research? I believe we’re about halfway there. For 20 years, most of our research funding went to cancer biology. Now we’re focusing only on taking that biology and moving it toward a translational component. Okay, 20 years. Is that the “shortest period of time?” What does it mean to be halfway to a cure anyway? The board asked me to take over as CEO to shape and fashion the organization because we’re all working on the 2020 plan…..
What is the 2020 plan? That’s ten years from now. Clock ticking. Is she referring to the the National Breast Cancer Coalition’s 2020 Deadline, the campaign oriented to eradicating breast cancer by 2020? Or does Komen have it’s own 2020 plan? We really hope Nancy will tell us WHEN we can expect to “end breast cancer forever,” and how Komen will achieve this lofty goal without making research the priority. Citation for this editorial: KomenWatch. (2011, April 15). Komen Contradictions: Cure Vs. Research. Retrieved from http://www.komenwatch.org/. Youtube videos have become the TV commercials of the digital age. This 32-second video clip of Nancy Brinker advertising the “behind-the-scenes” work of the Komen foundation is essentially the same thing. This particular clip represents something new for Komen in that it does not mention a promise to a dying sister and instead acknowledges the public visibility of Komen “t-shirts” and the relative invisibility of the inner workings of the organization. Brinker states that, people don’t see Komen’s hundreds of research grants, thousands of free screenings for low-income women, and millions of volunteers working [on something unspecified] late into the night all with the hope of someday making breast cancer itself invisible. Interesting commentary given the numerous critiques and concerns raised in recent years about: Komen’s relatively small percentage research allocations; superficial approach to breast cancer education and awareness; and obsession with branding, corporate partnerships, and trademark issues. Could these concerns be the spark for Brinker’s half-minute response? If Komen’s strategies have not reduced breast cancer incidence, rates of recurrence, or the number of deaths from metastatic disease, how will these same strategies work to “end breast cancer forever?” They won’t. They will only bring in money, pretty up the disease, create entertaining past-times for consumers, alienate the diagnosed who don’t fit Komen’s pretty pink model, divert resources from other organizations and research priorities, and yes, fortify the t-shirt industry. They won’t end the disease no matter how many commercials Nancy Brinker makes. There’s still so much we still don’t see. Citation for this editorial: KomenWatch. (2011, April 1). What We Still Don’t See. Retrieved from http://www.komenwatch.org/. “The multimillion-dollar company behind all those pink “breast cancer awareness” ribbons — the Susan G. Komen Foundation – uses less than a dime of each dollar to actually look for a breast cancer cure, as promised. It’s reported that the Komen Foundation owns stock in several pharmaceutical companies, including AstraZeneca, the maker of tamoxifen, a cancer drug that is actually classified as a human carcinogen by both the World Health Organization and the American Cancer Society. Guest Editorial: Gayle Sulik, M.A., Ph.D., author of Pink Ribbon Blues: How Breast Cancer Culture Undermines Women’s Health. In the last few weeks Susan G. Komen for the Cure was exposed. We have watched and listened as journalists, health advocates, philanthropists, bloggers, affiliates, Komen supporters, and countless others have shined a light on the obvious: The Komen foundation – breast cancer charity turned nonprofit corporation – is a juggernaut in the fight against breast cancer. In the past, many have overlooked the obvious. Blinded by pink. Fueled by hope. Engaged in an emotionally charged war against a disease that no one should have to bear alone. It all made sense somehow. Critiques of the world’s largest breast cancer charity were mostly hidden beneath a barrage of pinked propaganda. When anyone openly raised concerns they were met with accusation, hostility, and anger. Komen founder Nancy Brinker summarily dismissed as curmudgeons and naysayers those who would dare to confront the authority of pink. Though marginalized to some extent people have been, for years, arguing for fundamental changes in Komen’s version of the breast cancer paradigm. KomenWatch includes many of the arguments and concerns in its archives dating back to the 1990s. The news articles, reports, and letters from breast cancer survivors and others reveal a persistent questioning of the powerhouse organization. In 1995 Joelyn Flomenhaft wrote a letter to The New York Times editor saying that, although she had done so in the past, she would not be attending the Komen Race for the Cure because people were being told to write their years of survivorship on pink visers and badges. “Breast cancer survivors should have the right to choose to make their illness public,” she said, “not have their choice made for them by race organizers.” Her letter suggested that while some do feel empowered by sharing in this way, Komen’s expectations about how a person should display her survivorship may also exert undue pressure on the diagnosed. I’ve heard similar sentiments throughout my research of pink ribbon culture. Investigations into Komen’s activities suggest that the growing aversion to the organization’s approach to breast cancer support and awareness may be more than simply a matter of personal taste. In 2003, with support from the Fund for Investigative Journalism, Mary Ann Swissler examined Komen’s corporate and political ties and their influence on the direction of the Foundation. Komen’s literature did not reveal the lobbying ties, stock interests, seats on boards of private cancer treatment corporations, or the political activism of its key leaders, including Nancy Brinker herself. Yet Komen’s “stock portfolios and cozy relationships with Republican leadership” not only set them apart, their ties to cancer-related industry affected the organization’s objectivity and credibility. Sharon Batt, author of Patient No More: The Politics of Breast Cancer, told Swissler how Komen rose above the rest of the breast cancer movement in terms of power and influence. In the years that followed Swissler’s exposé the Komen organization was taken to task repeatedly, though sporadically, about how its political affiliations, high media profile, bureaucratic structure, corporate partnerships, industry ties, and market-based logic had led to questionable decisions. Squeezing out competing fundraisers is one of them. When Komen decided to expand its 5-K race to a multi-day walk, it started in San Francisco where Avon already had a 2-day walk planned. When Komen came in, Avon’s funds plummeted. KomenWatch told me that since the inception of its website numerous individuals have reported in confidence that Komen organizers have “deliberate strategies of non-collaboration” that keep them from attracting support for their smaller and less extravagant community initiatives. Against this background, it may not be surprising that Komen’s branding initiatives also involve legal efforts to keep other charities and organizations from using “for the cure” in their names. Komen’s recent decision to change granting criteria in a way that would preclude the women’s health network, Planned Parenthood, from applying for grants to offset the cost of providing screenings to low-income women, is the latest in a series of moves to prioritize Komen’s brand. Though the decision was reversed, KomenWatch is keeping eyes and ears open. The rest is up to you. As a medical sociologist, I’m glad to be part of this message. Kudos to KomenWatch. In the last three weeks, the reputation of Susan G. Komen for the Cure has been threatened by a scandal that has uncovered some uncomfortable truths about the behind the scenes in the world of Professional Breast Cancer Awareness. Although the organization has given the media the “move along, nothing to see here” speech, it appears that Komen CEO Nancy Brinker’s lavish spending is worthy of scrutiny. Plus, apparently she’s really weird to work for. … The most recent progressive home-run – the high-profile reversal by the cancer charity Susan G. Komen of its decision to de-fund the abortion advice charity Planned Parenthood (imagine Marie Curie doing battle with Marie Stopes) – has followed a familiar pattern of Twitter-enabled people power. In what politico.com has predicted will become the “textbook case on the political power of social media”, Komen executives were clearly overwhelmed by a half-a-million-a-day tweet tsunami, 80 to 1 against the decision, that engulfed them. The killing off of the internet censorship bills Sopa and Pipa in January, despite big-battalion backing by the entertainment industry, and Bank of America’s binning of a proposal to charge for debit-card usage at the height of the Occupy Wall Street protests, were similarly internet-fuelled successes. The US left, it seems, has gone from retreat to re-tweet in just a few short years. Enter Your Email Address to Subscribe to KomenWatch and Receive Notifications of New Posts by Email. KomenWatch Grants Full Permission to Republish KW Editorials in their Entirety, with Proper Citations and Links. Editorials Include Information on How to Cite! Copyright © 2011 by KomenWatch. Images and information on this website are used for the express purposes of commentary and criticism under the fair use doctrine.